Hello Monday! …Meet Saturday! 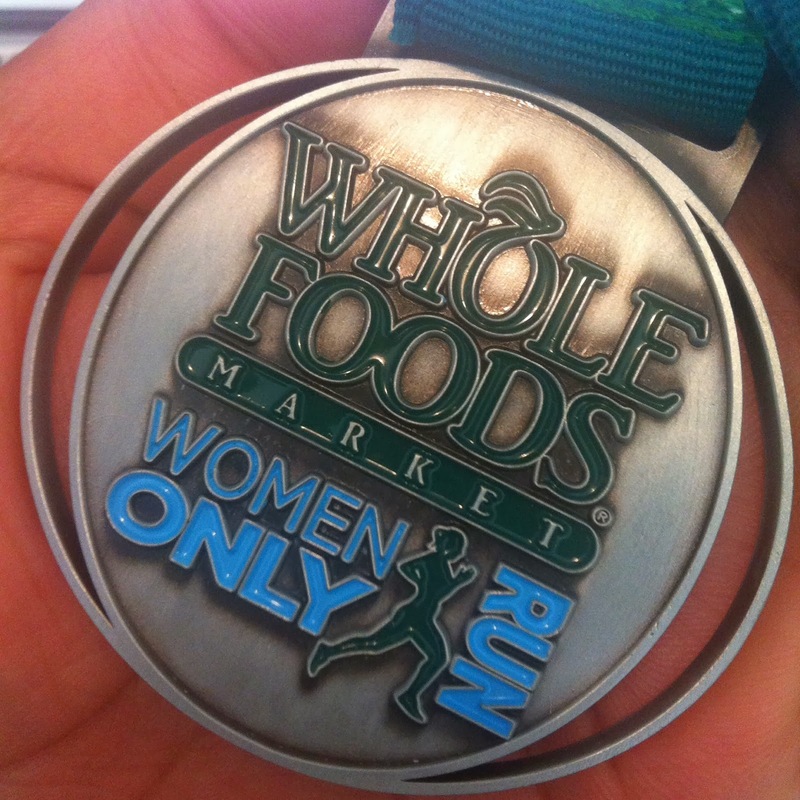 Saturday 19th October 2013…The day of the WholeFoods Women’s Only Run where I ran 10,000m. 2013 is after all the year of the 10km for me! Race day and the weather held up…at least until we were done running anyway. It really was ideal weather for running to be honest, cool, meaning that you warmed up nicely once you got moving! I made it to the ‘race village’ and had no problem picking up my missing race number; my timing chip arrived through the post but no race number was there! 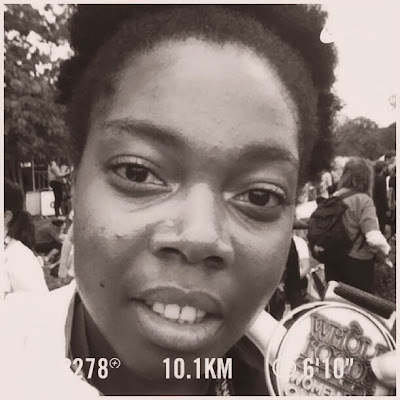 I didn’t even notice until I went on Instagram and saw that Leah of Naturally, Leah had both a timing chip and race number! I contacted Human Race via Facebook who said they’d send it out again but it still never came! But all is well that ends well! They also had Garmins available for (free) hire during the event. 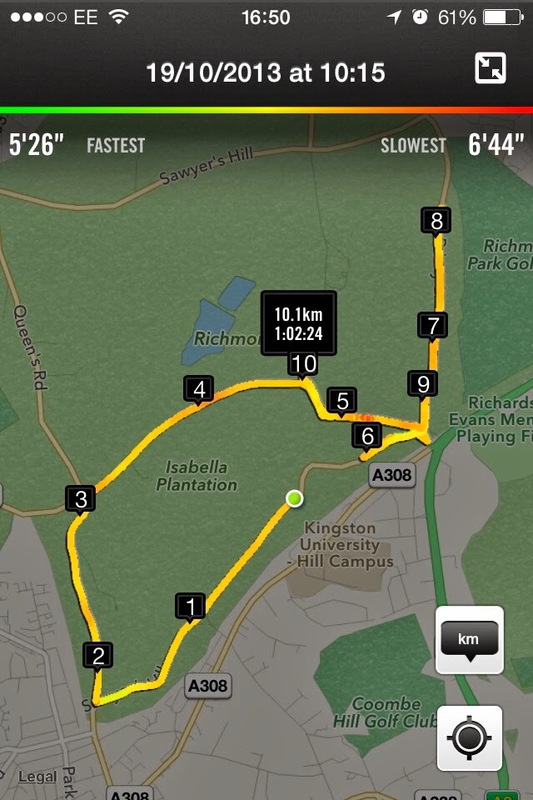 I was using Nike+ on the day so there was no need for me to have another GPS device. I was with one of the girls who hired one though and we spent a fair time trying to work out how it worked! …instructions anyone?! Bag drop was simple. Bonus that it only cost £1 instead of the £2 charge we had been advised of! I heard later that quite a few people had kicked up a fuss about this and rightly so! I’ve never been charged for putting a bag into hold at a race. I got to watch friends start their 5km race and give them a big cheer before I lined up at the starting line for my 10.15am start. The race started on time. This is always a bonus. 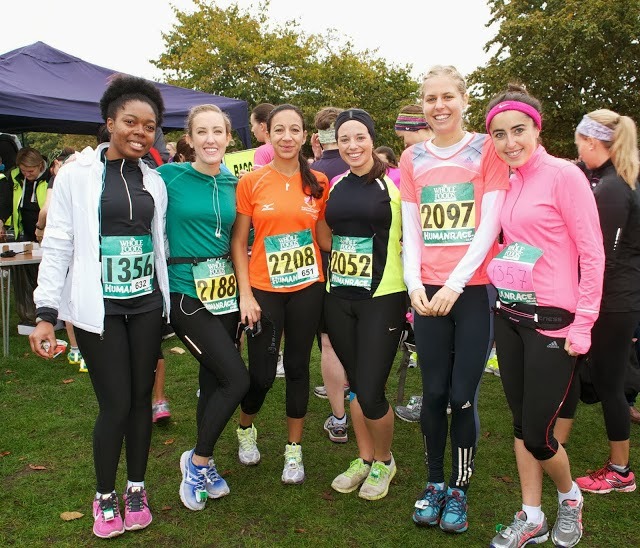 I came out the starting line and all the ‘crew’ on the day running the 15km were there to cheer me on! Made for a great start! 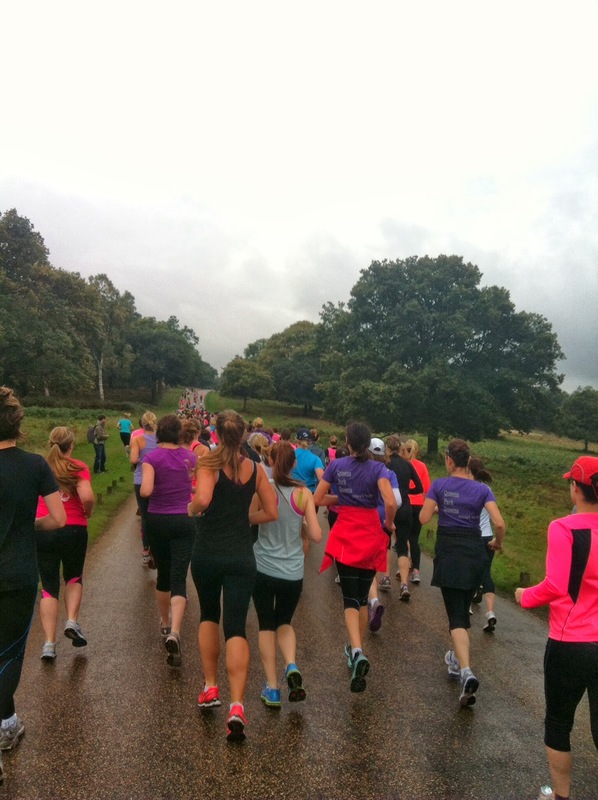 …until the first hill just a few hundred metres into the race. But to be honest it looked worse than it was! I just kept my head down, knees up and kept going! 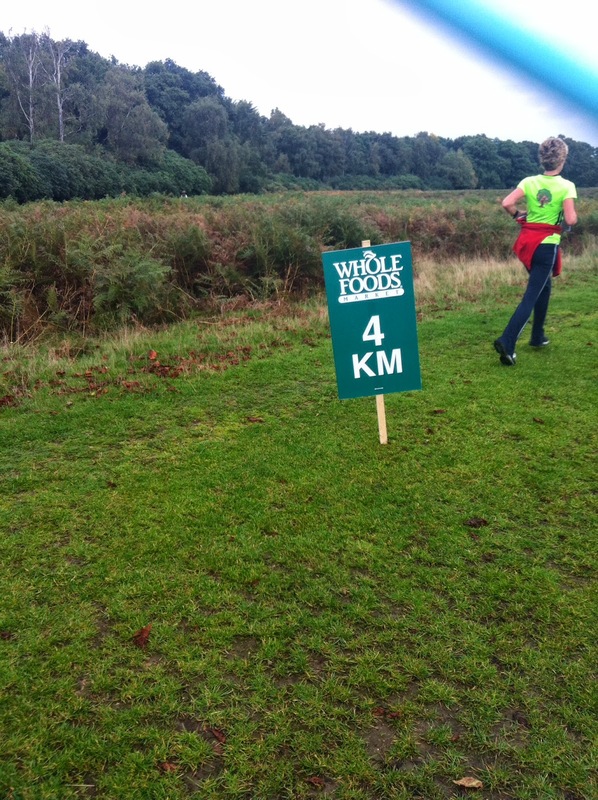 I kept an eye out for markers and noticed the first one at the 2km mark. 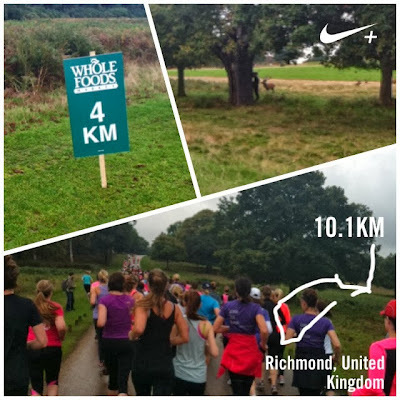 I had Nike+ keeping me informed of my distance, time and pace anyway so I was well aware of how I was doing. In my head, I struggled. As I got closer to the 5km mark I wondered if it would be weak of me to change distance. I decided it would be…I decided it was no example to set…to give up. 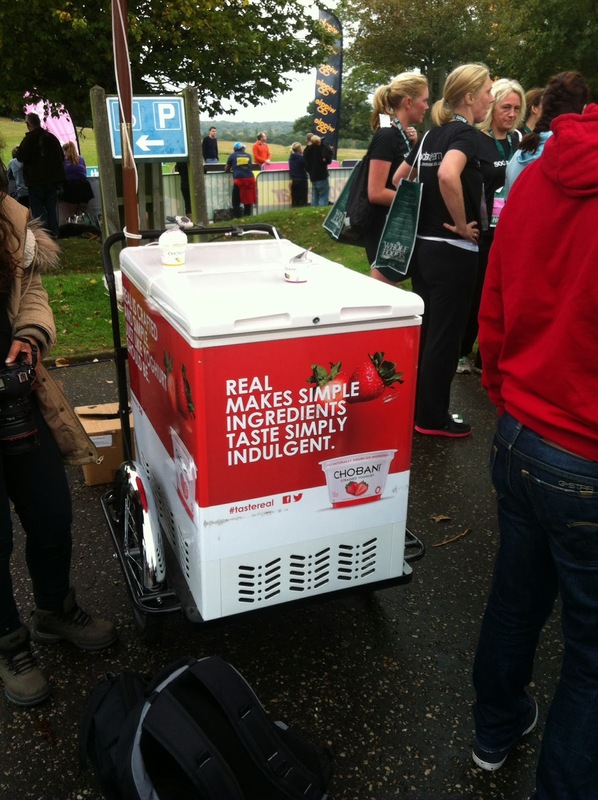 So as the 5km runners veered left just after our first water station, I went right to continue on the 10km route. is that a blue rainbow?! I started playing tag with a girl…where I’d run past her then slow down and she’d run past me. That continued from about the 8km mark to the very end. It kept me going though having someone to focus on! 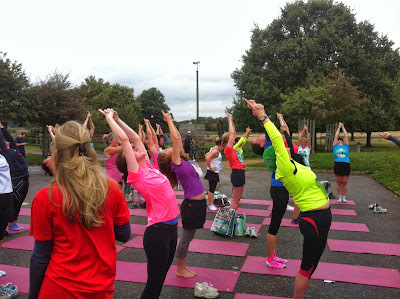 …What also was fabulous were all the girls running on the day that I knew who waved and cheered every time we passed each other on the course! I even got a couple of hi fives which spurred me on! The cheers via Nike+ were an even bigger bonus…they always make me push a little harder and I look forward to checking who thought of me while I was out racing! 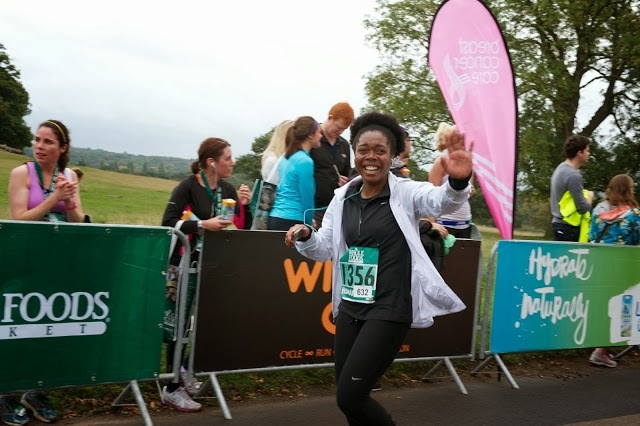 The crowd at the finish line was perfect; I even spotted Zoe from London and Me who from the picture, looks like she almost made me cry with happiness! Just enough to help me get a little sprint on! dont I look like I would cry?! I grabbed a medal and a goody bag so relieved to have completed the race! My legs and knee especially were pretty tired but I was feeling proud! post race protein hit! perfect! 1. We were informed that at points during the race, the course would be in opposition, y’know…just like a road. Remember to keep to the right we were told at the starting line. Of course, everyone gets a little tired and may forget but that’s what marshals are there for, huh?! Me: Are you a race marshal? Me: Are you a race marshal for this race? Me: Can you not see the runners are running in the wrong lane? You need to remind them to keep to the right! It’s really dangerous! I know we appreciate the encouragement but I would appreciate knowing I was safe more. This clearly was then an issue at the end of the race. With weary legs, I had a 40 minute walk back to the station. And that’s after 20 minutes of not even knowing which direction the station was in and not an (official) soul to ask! Huge shout out to Kate who I met on the walk to the station! We managed to chat away the time taking focus away from legs that needed to be resting…This race was definitely lacking in venue information and was heavily geared towards drivers (the start line was next door to the car park!). My race results were mediocre. Not my worst, not my best. Pretty good considering my knee pain. Oh and I had a bit of a technology fail when I tried to take a picture of the Deer while running; I managed to switch the camera on my phone to video which stopped my Nike+ and then trying to get the picture AND get Nike+ started again was an epic fail! I’m pretty sure that added to my time but I did manage to catch up with my tag friend before the finish line! 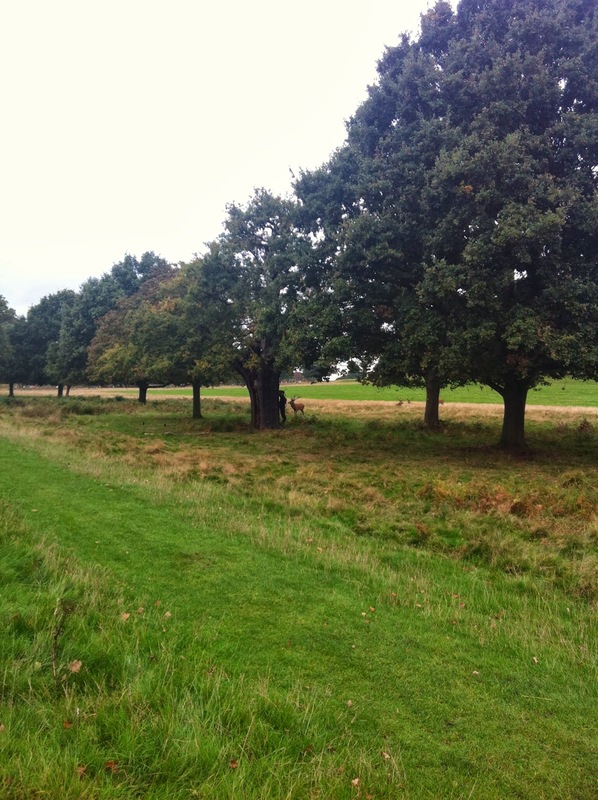 …without a decent picture of the deer to show you! All in all, the people and event organisation made for a great race day! ..the location of the start line put a bit of a dampener on things…but again, all is well that ends well! 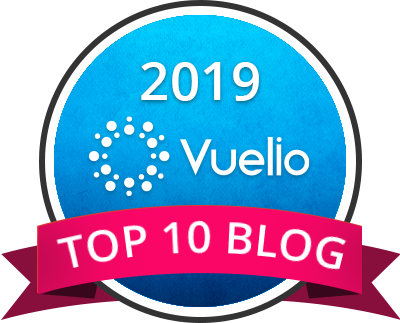 This sounds like a great event, nice recap and well done! I wish I had done it now, but we've only moved to London this week so things have been kind of hectic! Next time! That sounds silly about the course doubling back on itself and causing such confusion.